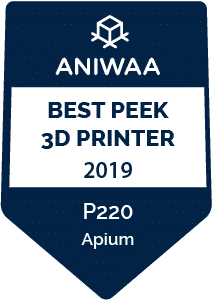 The Apium P220 is a PEEK-ready industrial 3D printer made by Apium, a manufacturer based in Germany formerly known as Indmatec. 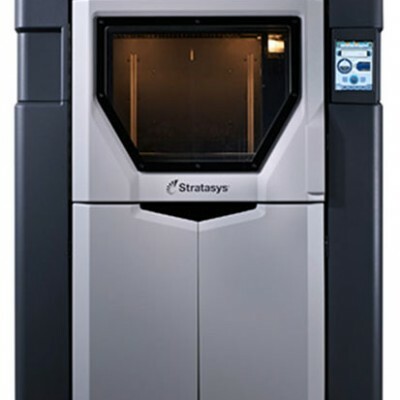 This closed-frame 3D printer enables to 3D print complex materials (PEEK, ULTEM). Apium also manufactures their own proprietary filament. Available materials include: PEEK, Carbon PEEK (30%), PVDF, POM-C, PP, and metals (316L, 17-4PH). The P220 is a larger version of the P155, with adaptive heating system and easy filament change system. Adaptive heating system (up to 180°C): enables temperature control on and within the part and offers the ability to control material properties at voxel-level. Integrated controlling software on a touch-screen: features print parameter optimization, a maintenance management system, and a process control system. Interchangeable nozzle: enables material changes within 2 minutes. Highly-heated 3D print bed (up to 160°C) and nozzle (up to 540°C): enables 3D printing specialty engineering materials (PEEK, PEI, metals, composites, etc.). Easy transportation: with its low noise emission and weight of 65 kg, no additional infrastructure is required. This PEEK 3D printer is available between €40,000 and €50,000. Please contact the manufacturer for more information about the Apium P220. Discover other PEEK 3D printers here.